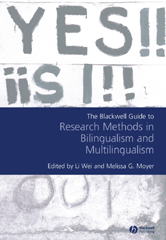 Written by leading experts in the field, The Blackwell Guide to Research Methods in Bilingualism and Multilingualism focuses on the methodology of research in this rapidly growing field. Highlights the interdisciplinary nature of research on bilingualism and multilingualism and offers a practical guide to the specific procedures and tools for collecting and analyzing data. Specifically addresses methodological issues, discussing research topics, core concepts and approaches, and the methods, techniques and tools available. Provides project ideas and practical advice on conference presentations and publication Brings together a team of leading international experts in the field. Links theory to method, and to data, answering the market need for a volume on bilingualism and multilingualism that deals with its methodology in a systematic and coherent way.